We all love those lush period dramas, movies that transport us back to a time when elegance was represented in opulent furnishings and luxurious details. But you don’t have to go to a theater to experience those days. A magnificent way to step back into an era of extravagance is by booking a scenic rail journey through the lush vineyards of the Napa Valley abroad the Napa Valley Wine Train. As one of the few active historic passenger railroads in the United States, the Napa Valley Wine Train offers an unforgettable experience that echoes the glory days of train travel, with fine dining service, multi-course meals cooked to order and panoramic Napa Valley scenes to gaze upon as you enjoy ultimate relaxation aboard exquisitely restored antique rail cars. The Napa Valley Wine Train features vintage Pullman rail cars resplendent with Honduran mahogany paneling, brass accents, etched-glass partitions and comfortable armchairs that evoke the spirit of luxury rail travel from the beginning of the 20th century. You can almost picture gentlemen in top hats and tails and ladies in stylish silk gowns sipping Champagne and dining on delicacies. Fortunately, no such finery is required these days. The Napa Valley Wine Train is a relaxed, inviting venue that features one of the most distinctive restaurants in the Napa Valley. You can even watch the magic happen as guests are welcome to view Executive Chef Donald Young and his culinary team at work in the kitchen car through windows along the train’s corridor. Executive Chef Donald Young’s gourmet lunch and dinner menus feature local, seasonal menu items that reflect the timeless sophistication of a bygone era, while catering to the palates of today’s diners with the highest-quality products provided by local and regional purveyors of fresh, sustainable food and beverage products. But it is the wine list, with its extensive selection of local Napa Valley vintages that truly exemplifies the sophistication of the Napa Valley Wine Train. There are options for all wine lovers, from the newest devotee to seasoned want-to-be sommeliers. All of this luxury may seem out of reach, but prices start at a very reasonable $149 for the Gourmet Express on the lunch and dinner trains. However, starting at only $224, the Dome car on the lunch and dinner allows guests to savor their gourmet meals while taking in an elevated view of the surrounding vineyards. Finally, if you’d like to combine your dining and train journey with visits to some of the Napa Valley’s iconic tasting rooms, select one of the Half Day Trip options. Choose from a Grgich Hills Winery Tour, the Ambassador Winery Tour, the Castle Winery Tour or Raymond Winery Tour. These superb packages range from $209 to $269 per person. For the ultimate wine country experience, opt for the Full Day Winery Tour, starting at $332 for lunch and offering a choice between the Legacy, Collective or Estate Tours. Each tour allows guest to relish a truly refined wine country experience at three of the valley’s most celebrated wineries. It is the perfect means of discovering the Napa Valley and enjoying the fruit of the vines without concerns of road travel. Have a special event coming up in your life? The Napa Valley Wine Train is the perfect venue to give your party an elegant ambiance and create memories to last a lifetime. The Napa Valley Wine Train is an exquisite venue for intimate Napa Valley weddings and receptions, bridal showers and rehearsal dinners, as well as family reunions, corporate events, incentive travel and other private gatherings. These amazing wine country train journeys fill up quickly, so be sure to make your reservations now by calling 800-427-4124 or visiting their website at www.winetrain.com. 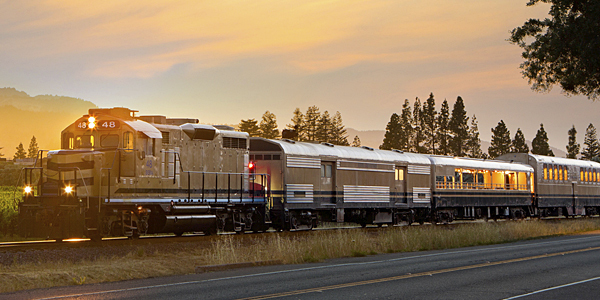 The Napa Valley Wine Train accepts all major credit cards and many packages offer accessible travel with advanced notice.